Most people are familiar with fungi that cause itchy toes and moldy bread. What if I told you that there are a multitude of fungi in an “Underground Internet” that wraps around the roots of almost every plant in the your landscape? Not only that, but also these fungi thrives by sucking energy from the plants to sustain themselves? Yes, these fungi are lurking in the soil of your landscape right now! Is this some Friday the 13th scary story intended to raise the hair on the back of your neck? No! These fungi are real and they are everywhere! They are mycorrhizas (pronounced my-CORE-rye-zuhs). This not-so-glorious association between plants, soil, and fungus is fundamental to plant establishment and growth. There are about 5,000 different fungal species that form a mycorrhizal relationship with over 300,000 plants. This association is an absolute necessity for the establishment of many plants. The absence of mycorrhizas often reduces the successful transition from nursery to soil of newly planted trees and shrubs. This is particularly true when the plants are added to the landscape where the soil is unprepared or depleted of organic matter and nutrients. importance of mycorrhizal fungi (endomycorrhizas that don’t form mushrooms) has been evident for at least 500 million years. Early fossil records indicate their presence during the Devonian period about 350 million years ago (mya). A more complex mycorrhiza (ectomycorrhizas that form mushrooms) arose during the Middle Cretaceous Period about 144 mya. Scientists believe that the marriage between fungi and plants was an essential step in the evolutionary process that brought plants from the marine environment to the terrestrial environment. What would the world be like today without the lowly fungi? Soil fungi form a root-fungus structure (mycorrhizas) that invades the roots of 85% to 90% of all the trees, shrubs, flowers, and vegetables in the landscape and forest. The mycorrhizal association is beneficial to both the plants and the fungus. The plant may supply up to 80% of its net energy (carbohydrates) and other growth nutrients to the fungus. The fungus increases water and mineral uptake (particularly phosphorus) of the host plant by increasing the total absorptive area of the root system. Mycorrhizal fungi are able to absorb and transfer all of the 15 major macronutrients and micronutrients necessary for plant growth. They release powerful chemicals into the soil that dissolve hard to capture nutrients such as phosphorous, iron, and other tightly bound soil nutrients. This explains why nonmycorrhizal plants require high amounts of fertilizer to maintain their health. Mycorrhizal fungi benefit the plants in other ways. The extensive network of fungal mycelium in the soil is important not only to nutrient uptake but also water uptake and storage. During drought conditions, mycorrhizal plants are under far less stress compared to non-mycorrhizal plants. Disease and pathogen suppression is another benefit for a mycorrhizal plant. These plants have a sheath around the root hairs that acts as a physical barrier against the invasion of root disease. Mycorrhizal fungi attack pathogen and disease organisms entering the root zone. Excretions of specific antibiotics produced by these fungi immobilize and kill disease organisms. Some mycorrhizal fungi protect some plants from Phytophora, Fusarium, and Rhizoctonia diseases. Mycorrhizal fungi also improve soil structure. Mycorrhizal mycelium produce humic compounds and organic glues (polysaccharides) that bind soils into aggregates and improve soil porosity. Soil porosity and soil structure positively influence the growth of plants by promoting aeration, water movement into soil, root growth, and distribution. In sandy or compacted soils, the ability of mycorrhizal fungi to improve soil structure may be as important as seeking out nutrients. Mycorrhizas are vibrant and live in close association with native plants. Estimates of the amount of mycorrhizal filaments (mycelium) present in healthy soil are amazing. Several miles of mycelium can be present in less than a thimbleful of soil underneath vigorously growing native plants. They increase plant stress and the need for water, nutrients, and soil structure that is mediated by the presence of mycorrhizal fungi. Avoid unnecessary roto-tilling or cultivation, as it will destroy the mycorrhizal web and the natural soil structure. Only amend the soil if it is necessary to improve the soil structure (heavy clay soils). Prevent soil erosion or the removal of topsoil. Do not leave the soil bare for extended periods. Cover the bare soil with mulch. Mulch the soil with organic materials (compost) that are a food source for soil organisms. Avoid over-irrigation since waterlogged soils will be harmful to beneficial soil organisms. Avoid unwarranted use of high phosphate fertilizers. Avoid over-fertilization and over-watering since they reduce mycorrhizal populations. Avoid unwarranted use of pesticides, fungicides, and herbicides. Fungicides can kill mycorrhizas. Use organic mulches for weed control and to help reduce soil compaction forces that lower soil oxygen levels needed by beneficial soil organisms and roots. 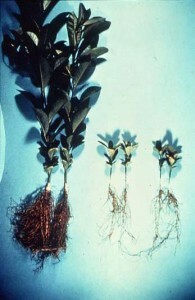 Nursery grown plants are often deficient in mycorrhiza. Plants raised in most nurseries receive intensive care. These artificial conditions, high levels of water and nutrients, and sterile soils keep certain soil borne diseases to a minimum and produce large quantities of plants for sale. Unfortunately, this intensive care often discourages the plant from producing an extensive root system necessary for transplantation and sustainable life. When transplanted these plants must be weaned, left to fend for themselves, or be inoculated with mycorrhizal fungi. Applying commercially available inoculants is slowly becoming a more prevalent practice with nurseries, landscapers, and homeowners. Adding mycorrhizal inoculants to the soil can lower mortality rates and reduce water and fertilizer consumption. There is, however, much uncertainty concerning where to obtain the fungi, what type to use, the quality of commercially available products, and the most effective application methods. A trip to the Internet reveals a boatload of companies trying to sell mycorrhizal inoculants. They may contain varying amounts of different species of fungi, different percentages of viable spores, as well as additives such as fertilizers, hydrogels, and a gimmick ingredient called “biostimulants.” Some inoculants contain spores specific to particular fungus species while others contain a broad mixture. The first order of business is to determine a specific plant’s needs and the present soil conditions. For example, some conifers (spruce and fir trees) usually prefer ectomycorrhiza while maple trees, camellias, marigolds, and others prefer endomycorrhiza (see A Bit of Dirt, Winter Edition, 2007). 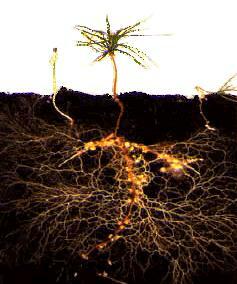 Mycorrhizal inoculum can come from native topsoil or may be obtained commercially. Buying commercially produced mycorrhizal inoculants can be expensive but is much less labor-intensive than collecting forest soil. Removing “donor” soil from natural areas may cause existing plants to suffer from root disturbance as well as opening areas to invasion of weed species. Native forest “donor” soil might come laden with weeds, pathogens, and non-native pathogens such as Sudden Oak Death. To make your own inoculum, you’ll need some supplies and a recipe for success. Growth Medium: A good growth medium is sterilized quartz (coarse construction sand can be substituted). Rinse the sand well to remove the finer dust particles. Sterilized sandy soil can be used if it has good drainage (to sterilize heat at 200 degrees F for 60 minutes and then cool). An alternative medium is a mixture of 1 part by volume of peat moss with 3 parts by volume of either horticultural grade vermiculite or perlite. Do not use a medium that contains phosphorus (P) fertilizer. Fungi. Collect fine roots or soil from the root zone of native vegetation from habitat you are restoring or from specific pants that are likely to be mycorrhizal (See A Bit of Dirt, Winter Edition, 2007 for a list of mycorrhizal plants). Host Plant Seeds: Select seeds from a fast-growing native plant species for the sacrificial “host” plant. Corn or sorghum seeds work well for endomycorrhizal or AM inoculum. Soak the seeds in 10% solution of household bleach for about 5-10 minutes to sterilize their surface. Germinate the seeds by placing them between moistened paper towels on a plate placed in a loosely sealed plastic bag. Corn seeds will germinate in about 2-3 days. Ectomycorrhizas are associated mostly with trees and the seeds need moist-chilling called stratification (Refer to The Reference Manual of Woody Plant Propagation, Dirr and Heuser, Varsity Press, Athens, GA). 1/5 teaspoon of Epsom salts (MgSO4), and 1.5 milliliters (a milliliter measuring spoon is available in most drug stores) of a concentrated phosphate fertilizer solution called Quick Start (4-12-4) made by Miracle Gro®. Add 1 cup of fine roots per gallon of sand growth medium and mix thoroughly. Add 1 teaspoon of slow release fertilizer for every gallon of potting soil. Set up several pots to produce sufficient inoculum. Sow 4-6 “host” plant seeds in you container. The object is to maximize root development in the pot so that the medium is completely filled with a mass of roots. After seedlings emerge, if you are not using slow release fertilizer, fertilize weekly with 1 cup of your homemade, low-P liquid fertilizer solution per gallon of potting soil. Water in between fertilizer applications. Let plants grow for about 16 weeks (mycorrhizal fungi should form in about 6 weeks). After week 14 stop watering to allow the plants and potting mixture to dry slowly and completely in a greenhouse or cold frame for a period of 2-3 weeks. Remove the aboveground portion of the “host” plant and discard. Dump the medium and roots from the pots onto a clean, sterilized tray. Cut up the roots using shears or scissors and mix the fragments into the growing medium. This root sand mixture is your crude but concentrated fungal inoculum. The inoculum can be stored for six months (one year maximum) in plastic containers and kept in a cool, dry area like a refrigerator. inoculate non-mycorrhizal plants that are being transplanted.